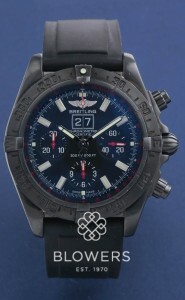 The Breitling Chronomat was first designed to meet the demands of the Italian Frecce Tricolori aerobatics team. Since its initial release by Breitling over 30 years ago, the Chronomat remains the watch of choice for many aeronauts, representing precision, speed, and adrenaline. Its unique circular slide rule enables pilots to make vital calculations. Browse Blowers’ current stock of Chronomat watches below. All watches on our website are physically in stock at our Kingston upon Hull store. They can also be viewed, by appointment, at our office in London’s Mayfair. Looking for a specific model? Get in touch and we will endeavour to source it for you.